We were talking today about Sesame Street and the Muppets and some of the stuff that we got traumatized with as children watching TV in the US and I remembered the dancing slinkies - one of my favorite Muppet skits next to classic Mahna Mahna. I blogged a while ago (in my drum comparison entry) that I’d never gotten 100% on a song playing the drums in Rock Band, even on easy difficulty, and I generally play on medium or hard. It was like my own personal Curse of the Bambino going on - no matter what I did, I’d always miss one note. Maybe it was a stupid mistake on my part, maybe it was a double-hit registered, but whatever the reason, never did I get 100%. 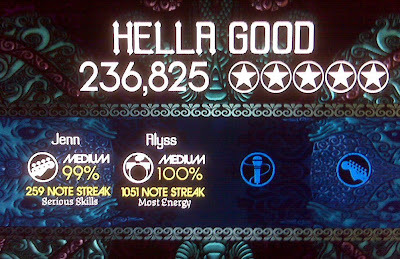 Last night I got 100% on the No Doubt song “Hella Good” on medium difficulty. Interestingly enough, I actually got two 100% songs last night - the other was “My Best Friend’s Girl” by The Cars. The hardest songs in the world? Not by a long shot, but I’m still pretty proud. I’m not afraid to admit I was singing songs about how I’m the King of Drums last night. No, I’m not an awesome drummer, but I was pretty stoked with myself.